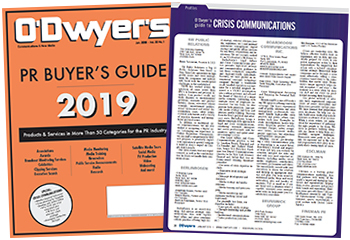 Your company can appear in O’Dwyer’s online PR Buyer’s Guide for only $25! Fill out the form below and as soon as we receive your submission we’ll place your listing(s) online. Basic listing cost is $25 per category (each additional category is $20). An enhanced listing including your company’s logo and up to 75 words of copy describing your unique services and products is available for $250 (each additional category is $200). Choose the category in which you wish to be included from the list above. $25 for the first category and $20 for each additional category in which your listing appears. Call me for credit card information to charge the cost of the listing.